We still haven’t found that one perfect Windows 10 laptop, but LG may be close. The LG Gram offers a high-end metal design that’s lighter than Apple’s MacBook Air while offering a larger screen. LG’s new laptop weighs just 2.16 pounds and is available in 13-inch and 14-inch flavors. That’s just barely heavier than the new 12-inch MacBook and noticeably lighter than the 13-inch MacBook Air (2.96 pounds). Combined with solid specs and Microsoft’s latest software, LG seems confident it can win over American shoppers. “We recognize this is an extremely competitive category, and are confident consumers will respond well to this product that combines powerful performance with lightweight design,” said LG USA’s marketing chief David VanderWaal. The LG Gram features a rugged design with a mix of carbon-lithium and carbon-magnesium. It packs a 1080p display with a 16:9 aspect ratio, 7.5 hours of battery life and USB 3.0, microUSB, microSD and HDMI ports. It runs Windows 10, including Cortana and the new Microsoft Edge browser, though there’s no built-in support for the company’s new Windows Hello biometric software. 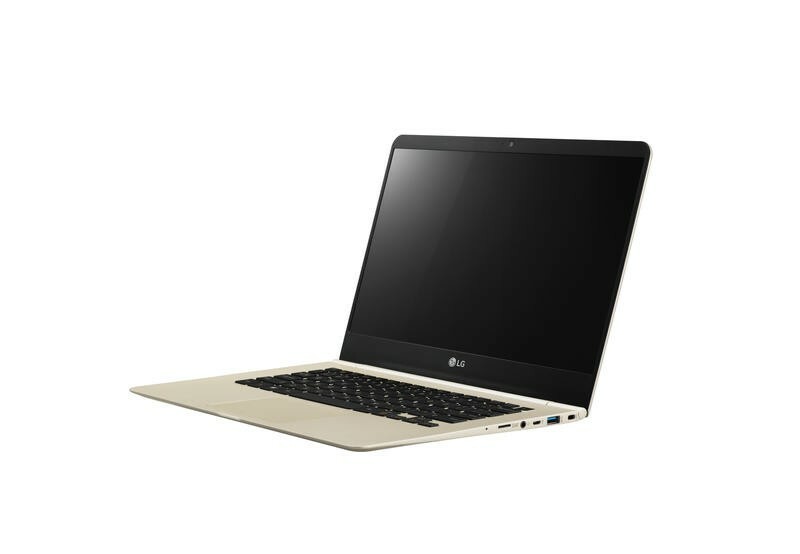 The LG Gram starts at $899 for the 13-inch model in white with an Intel Core i5 chip, 8GB of memory and 128GB of storage. For a $100 more, you can buy a 14-inch version in gold. At the high-end there’s also a 14-inch gold option with a faster Core i7 chip and a whopping 256GB of storage for $1,399. The LG Gram is available from Amazon and will be available from Microsoftstore.com and in Microsoft Stores soon. ENGLEWOOD CLIFFS, N.J., Sept. 28, 2015 – LG Electronics USA announced a U.S. market first: the launch of LG’s line of premium lightweight laptops – LG gram series. LG gram laptops are available now at Microsoft stores across the country as well as online at microsoftstore.com and Amazon.com. Named the LG gram as a nod to the devices’ extremely light weight, the line is perfect for the everyday user looking for a high-performance laptop that is portability and durable with a sleek, modern design. 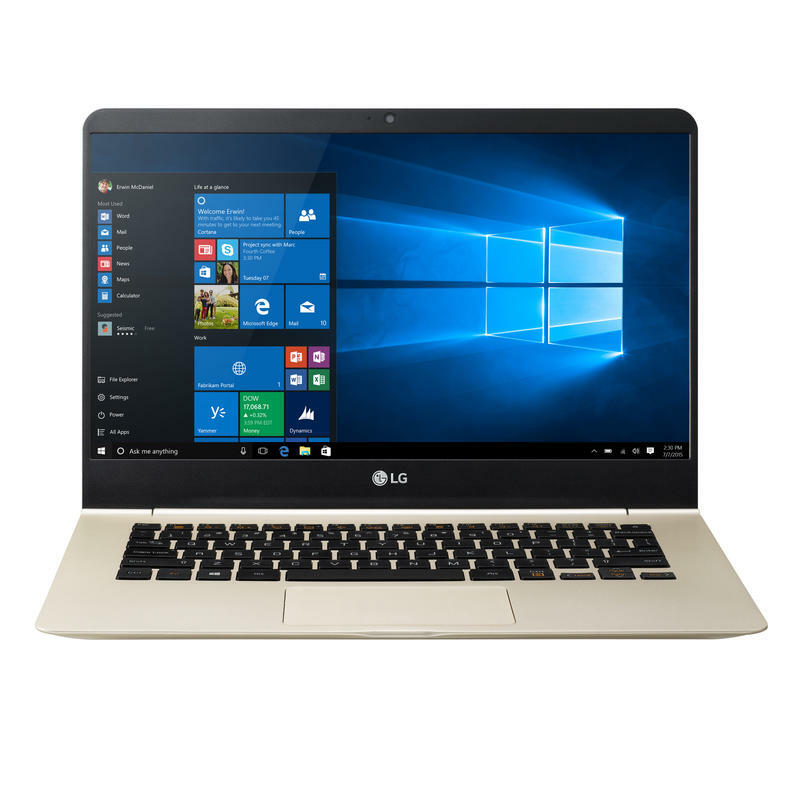 In fact, the LG gram 14 is among the lightest laptops in the 14-inch category, weighing only 2.16 pounds — less than the MacBook Air. In addition, the body is made of carbon-lithium and carbon-magnesium, the same materials found in spacecraft and race cars, giving the LG gram 14 an exceptionally strong rugged framework that stands up to everyday life while remaining lightweight. Finally, at just a half-inch thin, the LG gram 14 can be packed up and taken anywhere easily. The launch of LG’s first laptop series in the U.S. is perfectly timed with the debut of Windows 10, setting the stage for a new player in the laptop game that Windows lovers can use with ease. The LG gram series comes fully equipped with Windows 10, including Cortana and Microsoft Edge for a more personal and productive computing experience. All are Microsoft Signature Edition laptops, which means a clean, fast and protected experience – each PC is free of installed junkware, is performance-tuned and has a fully virus-protected system. It also delivers powerful performance with fifth generation Intel® Core™ processor (either Intel Core i5 or i7). The LG gram series provides users with the portability of a slim, lightweight laptop design without sacrificing performance, speed or access to a plethora of connectivity options. It supports the latest standards for connectivity, including Wi-Fi and Bluetooth wireless technology, along with extra ports for USB 3.0, a micro-USB and micro-SD slot. It also comes with a built-in HDMI port, which is uncommon among laptops of this size, which generally require HDMI adaptors. With LG gram’s instant boot feature, the operating system starts up immediately when the user opens the display whether it’s totally powered off or simply in sleep/hibernation mode. It also boasts a battery life of up to 7.5 hours, allowing most users to enjoy a full day’s use in a single charge. Following in the tradition of LG’s breathtaking TV displays, LG gram series also offers a rich viewing experience with Full HD picture quality, boasting a 1920 x 1080 resolution and 16:9 aspect ratio for a more lifelike, immersive viewing experience. The display also features LG’s In-Plane Switching (IPS) technology, which ensures accurate color saturation and contrast, even at wide viewing angles. “Reader Mode” provides optimal conditions for reading by reducing blue light, helping to protect your eyes and allow for comfortable reading during extended periods of time. LG gram series also offers advanced sound quality thanks to its built-in Digital-to-Analog converter (DAC), which allows users to experience hi-fi quality sound with less noise and distortion.